When you are designing your vinyl banners, it is important that you keep all of your important text, logos and images away from the edge of the banner. The finished size is the printed size of your banner. If you want a 3' x 6' vinyl banner, you should set your artwork size to a 3x6 proportion. Your background image should extend all the way to the edge of the banner. You will not need to add any bleeds. We will add the hems and grommet marks to the file for printing. Vinyl banners are finished with heat welded hems and grommets. 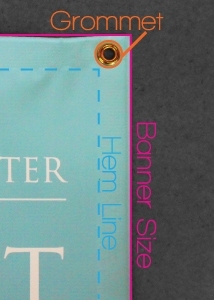 The hem line is approximately one inch of the vinyl banner that is folded over and welded together. The hem line is a little thicker than the rest of the banner because there is twice as much material there. Grommets are placed every 2-4 feet around the banner perimeter. They are used to help hang the banner. 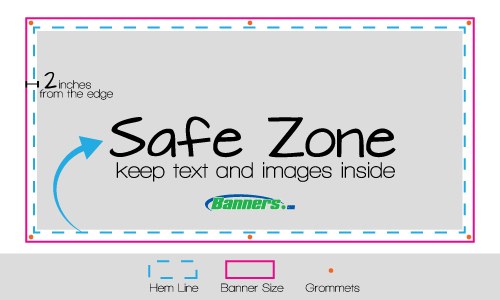 The safe zone is the area on the inside of the banner that will not have any hems or grommets on it. We recommend leaving at least two inches around the edge of the banner that doesn't have any text, logos or important information on it. This will prevent a hem or grommet from going through the information. When your file is ready, click here to upload your artwork.